Hello! Melizza here from Pincushion Treats. 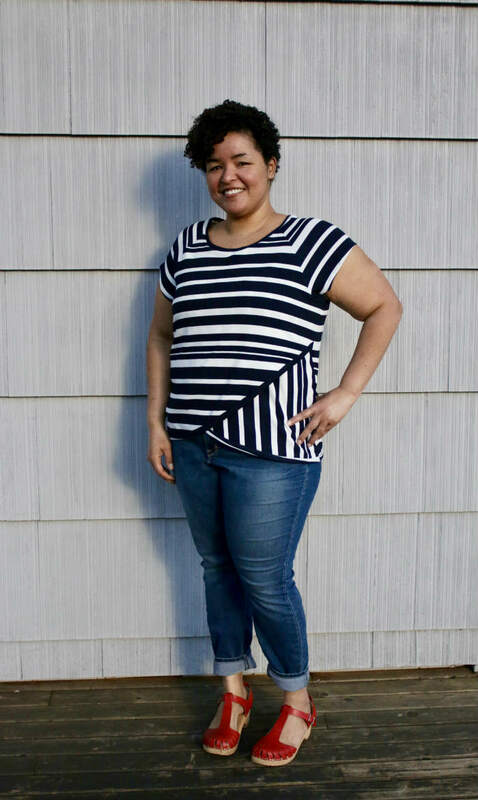 Today I’m bringing you my version of the Tulip Top. I’ve been itching to sew this for ages. It’s been raining in Seattle for months! Here’s a bit of trivia for you: apparently we have had only three mild sunny days since October! I am so ready for spring, so much so I decided to make a weather appropriate top. 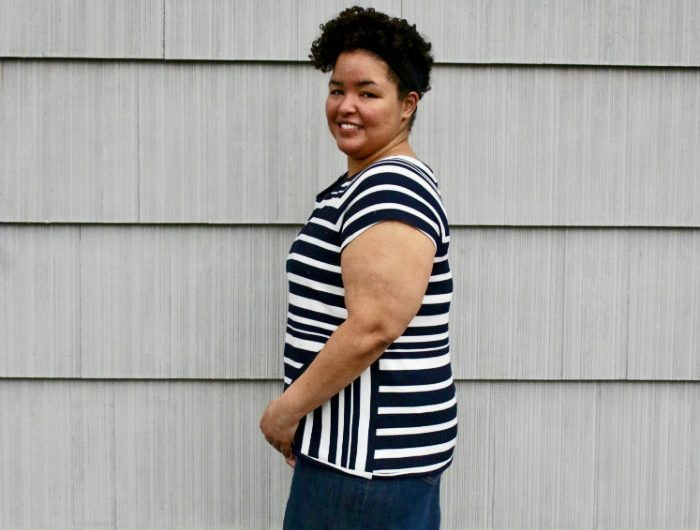 I made a short sleeve version out of some lovely navy striped Liverpool knit I bought from LA Finch Fabrics (great service, love that shop!). I really enjoyed playing with the stripes. 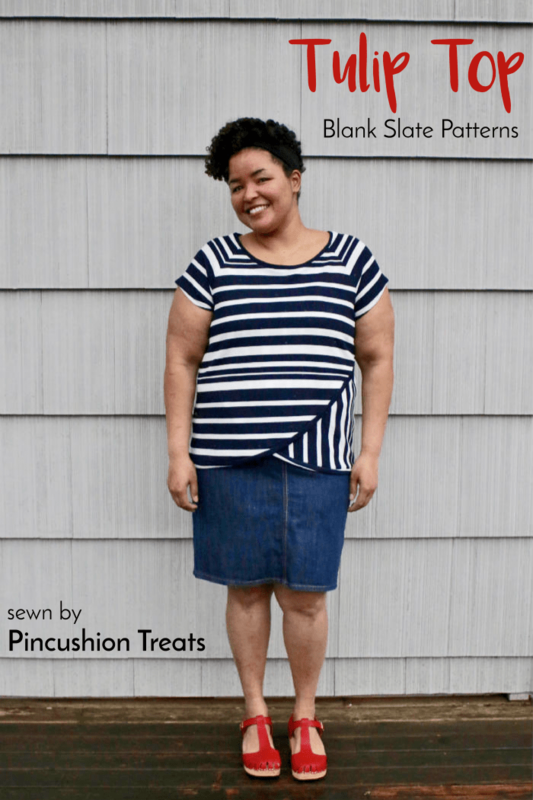 This pattern allows for a lots of creative possibilities: playing with patterns, color blocking, tulip in the back or front…lots of possibilities. Best part: it’s a fast and satisfying garment to sew. I made a 1X and made no adjustments. Sticking with the skirt theme for the month, I paired my top with a denim skirt. The top doesn’t compete with the skirt and I love that. The top shines and gives me the springy feeling I am so needing now. Looking forward to wearing it when I go on vacation next month. When the temperature cools again, I plan to make another version using some quilted sweatshirt knit I’ve been longing to use. With the pattern being so quick to make, only makes sense to make a few in various colors and style combinations, right? I leave you this picture of me wearing the top in the one sunny day we had in a month. Sun, can you hear me? I miss you!